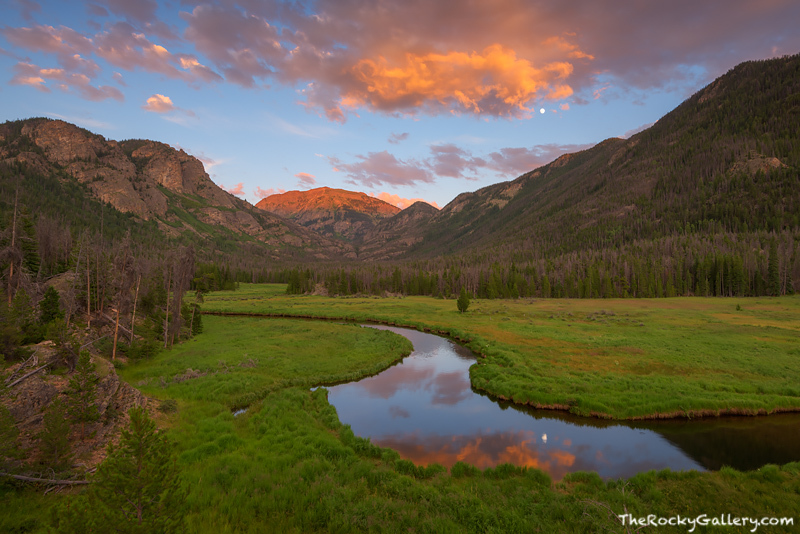 Scattered clouds over Mount Craig (aka Mount Baldy) and the East Inlet part enough of the sky to allow a quick glimpse of the moon rising over the meadow on what is a beautiful night in Rocky Mountain National Park. Far off in the meadow a large bull moose grazes on the verdant grasses found in summertime on the East Inlet and sunset paints the sky and the top of Mount Craig in a vibrant orange which contrasts beautifully against the green grasses of the lush meadow. Photo © copyright by Thomas Mangan.